What can be done to lower the front of my trailer? Can the pin box be raised?I measured the trailer and it looks about 13'9". I did this eyeball as I don't have a long enough level. I have a Ram 3500 srw megacab with the factory pucks, airbags and a Q20 slider. Truck doesn't squat pulls awesome. I use the alt trailer height as well. The Q20 hitch cant be lowered anymore and I think the limiting factor in it is the adapter that added 1 1/2". Is there anyone with this truck and trailer? Really don't want to buy a new hitch $$$ unless it cures my stress. First find out how much you need. Find a level area with the truck and trailer together and measure from the ground to the top of the bed rail. Add 6” to that. That is measurement #1. #1 - #2 = lift needed at axles. [QUOTE=dhornauer67;675058]What can be done to lower the front of my trailer? Can the pin box be raised? Yes but you need to maintain about 6" of bed rail clearance. 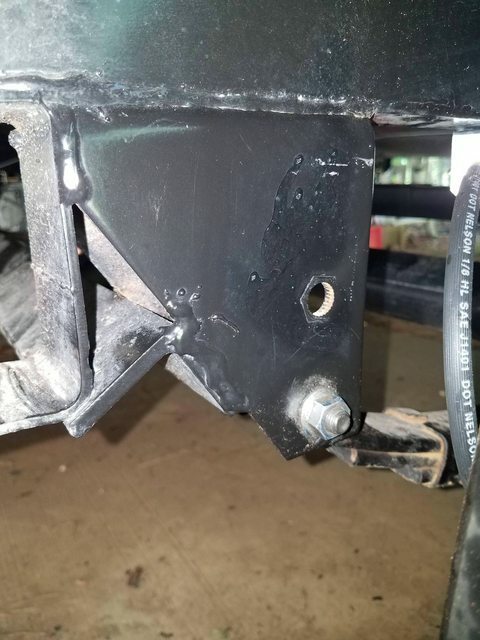 You may be able to adjust your suspension to the lower hole. That’s high. That’s real high. You better check that number again. And don’t go less then 6” on the bed rails. Maybe you should let that truck squat 3 inches. I have a 2016 Ram Dually long bed. Just purchased this spring and pull a 2015 Eagle Premier 361REQS. Use a Curt Q24hitch in factory pucks. Have 5 inches of clearance on bed rails. Was concerned that I might be nose high but truck squats enough to pull level. Measure 13' 2" on top of front air conditioner that is low profile. I will check the numbers that 2naEagle suggested. This is a 2018. No axle adjustment holes as it is factory Moryde 3000. The tires are huge 255. So lowering trailer axle may cause tire rubbing. I will measure the bed distance but it is ginormous. Think in the 8-9 range. Also Ram with factory airbags, This thing will not squat unless I move the slider back. There looks to be an extra hole in the pin box. Being the newer rubber Moryde, it also looks lower than previous Northpoints. With the trailer hooked up to the truck you can measure the fender wells at the front and rear axle. I'm looking for a level tow and adjust air bags accordingly. The MORryde 3000 is not where you do the adjusting. It is at the front and rear shackle mount. 6" is plenty. 8-9 is just too much. I can take some pictures of the suspension and hookup later. The one pic here does show the nose in the air and lots of daylight between bed and trailer.